Download "69-26. Airbag. Special tools. VAS 5094 Airbag adapter"
7 69-32 Safety precautions when working on airbags Testing, removing, installing and repair work may only be performed by qualified technicians. When working on airbag system, battery ground (GND) strap must be disconnected. No waiting time is necessary after disconnecting the battery. When connecting airbag system to a voltage source no person can be present inside the vehicle. Technicians must electrostatically discharge themselves by touching a suitable metal part, for example, a water pipe, heater pipe or metal frame, before picking up (touching) airbag unit. 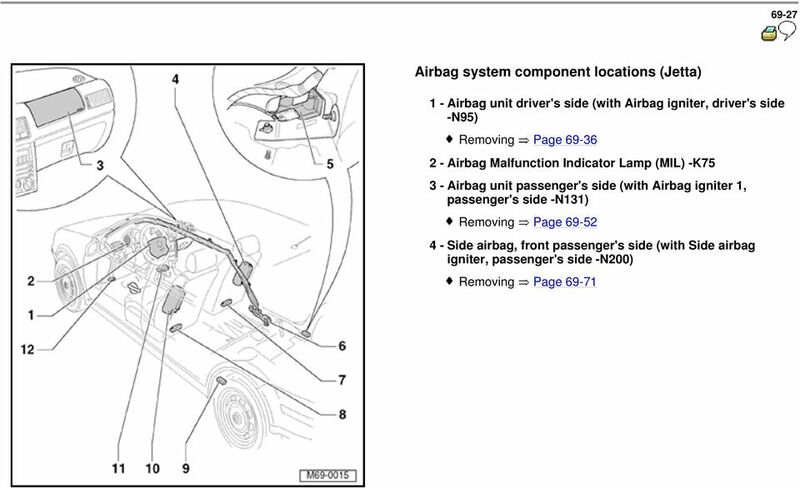 Airbag units should be installed immediately after removing them from their packaging. 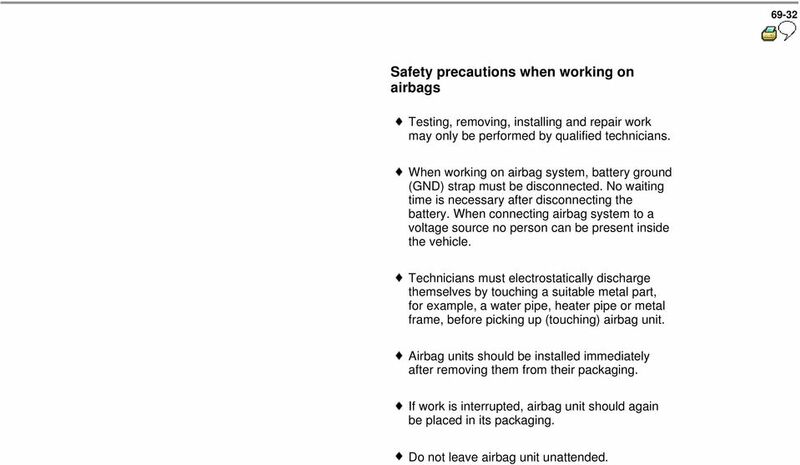 If work is interrupted, airbag unit should again be placed in its packaging. Do not leave airbag unit unattended. 8 69-33 Airbag units which have been removed should be stored so that upholstered side is facing up. Airbag units which have dropped onto a hard surface or show signs of damage must not be installed in the vehicle. Airbag units which have not been activated should be marked and returned to manufacturer for disposal in original airbag unit transport containers. 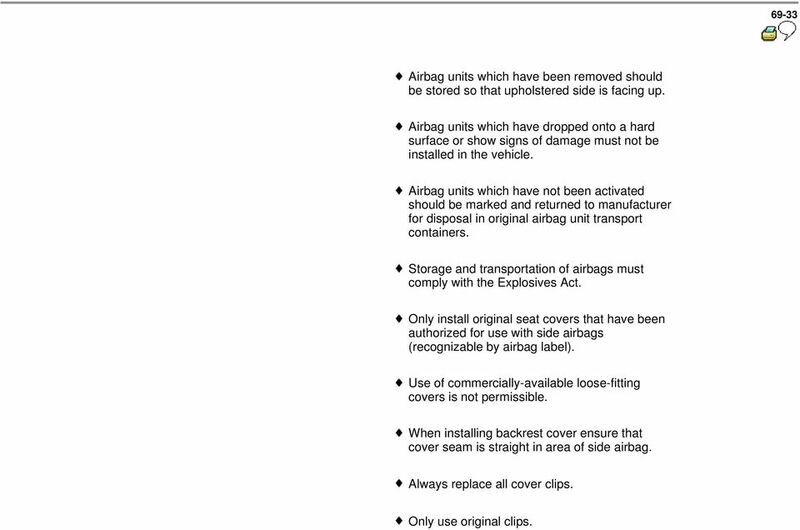 Storage and transportation of airbags must comply with the Explosives Act. Only install original seat covers that have been authorized for use with side airbags (recognizable by airbag label). Use of commercially-available loose-fitting covers is not permissible. When installing backrest cover ensure that cover seam is straight in area of side airbag. Always replace all cover clips. Only use original clips. 9 Always replace cover if damaged in area of side airbag - torn, burn holes etc.- for safety reasons. 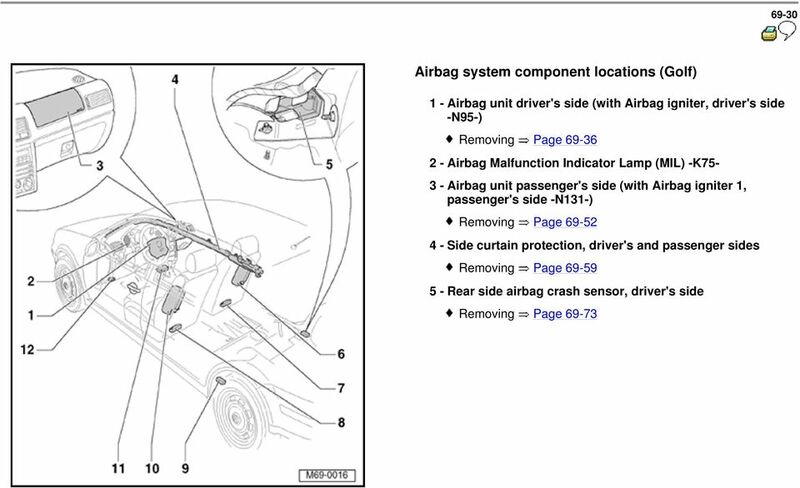 12 69-35 Accident not involving activation of airbag If Airbag Malfunction Indicator (MIL) -K 75 does not indicate a fault, it is not necessary to replace airbag components. Seat belts should be checked separately. After replacing airbag units or the control unit, affix stickers (only tear-off strips) to registration card and return registration card to relevant dealer or to Importer for registration. The registration card must be ordered separately. 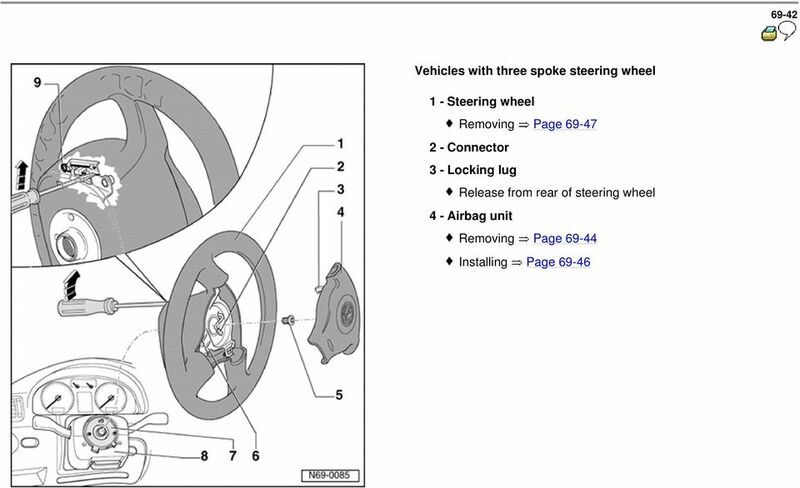 13 69-36 Driver's airbag unit, removing and installing Vehicles with four spoke steering wheel Four spoke steering wheels are supplied by two vendors. Airbags supplied by Petri mount with rectangular retaining studs -1-. Airbags supplied by TRW mount with stepped pins -2-. Because of the differing engaging mechanisms, only steering wheels and airbag units from same supplier can be installed. Replacement parts must be from same supplier. 16 69-39 Removing - Disconnect battery ground (GND) strap. - Release steering column height adjustment. - Turn steering wheel until steering wheel spokes are vertical. Pull out steering column completely and press down to lowest position. - Secure steering column adjustment. - Insert screwdriver (approx. 175 mm or 6.8 in. long) from reverse side into hole of steering wheel hub (insert screwdriver approx. 45 mm or 1.8 in.). 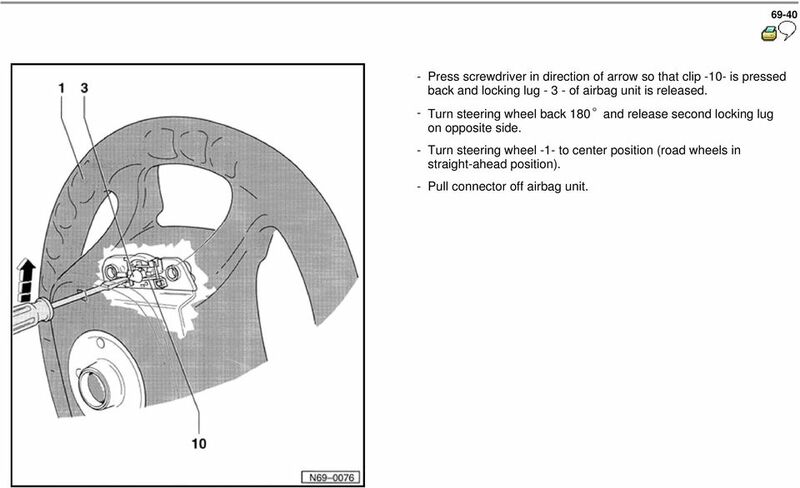 17 Press screwdriver in direction of arrow so that clip -10- is pressed back and locking lug of airbag unit is released. - Turn steering wheel back 180 and release second locking lug on opposite side. - Turn steering wheel -1- to center position (road wheels in straight-ahead position). - Pull connector off airbag unit. 21 69-44 Removing - Disconnect battery ground (GND) strap. - Release steering column height adjustment. - Turn steering wheel - 1 -, until steering wheel spoke is vertical. Pull out steering column completely and press up to upper position. - Secure steering column adjustment. - Insert screwdriver (approx. 175 mm or 6.8 in. long) from reverse side into hole of steering wheel hub (insert screwdriver approx. 45 mm or 1.8 in.). 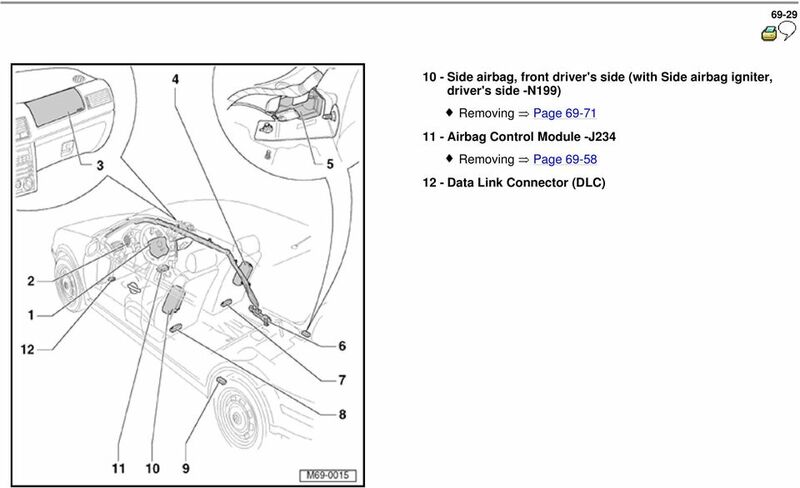 22 Press screwdriver in direction of arrow to press back clip -10- and release locking lug of airbag unit. 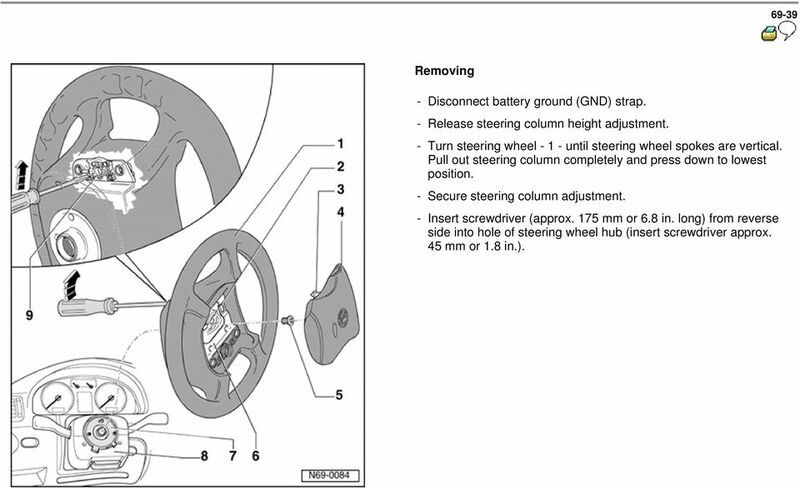 - Turn steering wheel back 180 and release second locking lug on opposite side. - Turn steering wheel -1- to center position (road wheels in straight-ahead position). - Pull connector off airbag unit. 26 69-49 Removing Driver airbag removed. - Turn steering wheel to center position (road wheels in straight-ahead position). - Remove multi-point socket head bolt and pull steering wheel off steering column. 27 69-50 Airbag spiral spring/return spring with slip ring, removing and installing Notes: Steering must be in center position (road wheels in straight-ahead position) when coil connector and slip ring are removed and installed. Replacement slip ring -F138 is secured as a new part in center position with cable tie. Removing Driver airbag unit and steering wheel removed. - Remove two screws -arrows-. - Remove upper steering column switch trim -1-. 28 Remove three screws -arrows-. - Release steering wheel height adjustment Take off lower steering column switch trim Separate connection Release locking lugs -arrows- and pull airbag spiral spring/return spring with slip ring - F138 off steering column switch. Notes: Steering must be in center position (road wheels in straight-ahead position) when coil connector and slip ring are removed and installed. Replacement slip ring is secured as a new part in center position with cable tie. Installing - Install in reverse order of removal. 33 69-56 Removing CAUTION! Before working on electronic components, disconnect the battery ground (GND) strap. - Remove center console Page Remove glove box Page Remove four Torx-head screws Press airbag unit -1- along with supports -4- up and out of mounting elbow on central tube -3-. 37 69-60 Removing Notes: Before disconnecting battery cables, take all notes into account regarding coding in radio operating instructions. 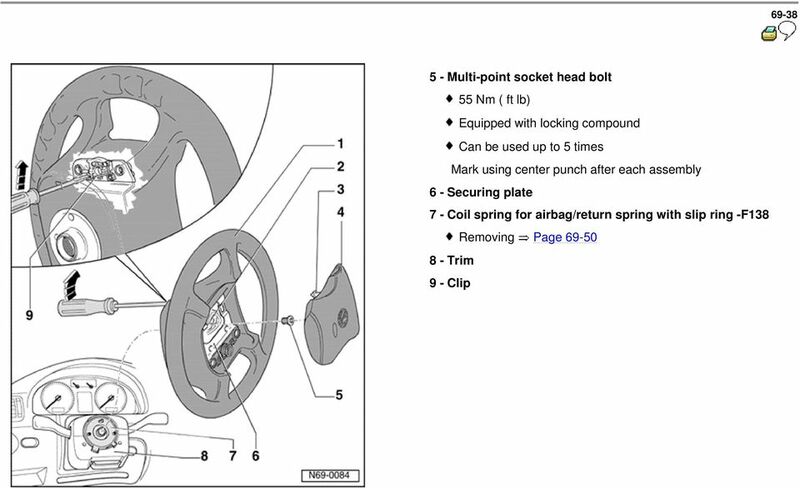 After reconnecting the battery cables, check vehicle equipment, such as radio, clock and window regulator as shown in the repair manual and/or the owner's manual. Technicians must electrostatically discharge themselves by touching door lock or vehicle body briefly before separating igniter and ground (GND) wires. 38 Remove the upper trim panals of the A pillars Page Remove the upper trim panals of the B pillars Page Remove the upper trim panals of the C pillars Page Remove inside roof lining Page Disconnect the battery ground strap. - Detach connection Remove screw -4- and pull side curtain protection downward out of the angle brackets (latches -2- install the side curtain in retaining brackets). 39 Pull gas alternator -1- out of the bracket Take side curtain protection out the vehicle without kinking. Installing Install in reverse order of removal. - Switch on ignition. - Close all doors. - Connect battery ground (GND) strap. WARNING! No persons may be inside vehicle during this step. 41 69-64 Removing Notes: Before disconnecting battery cables, take all notes into account regarding coding in radio operating instructions. 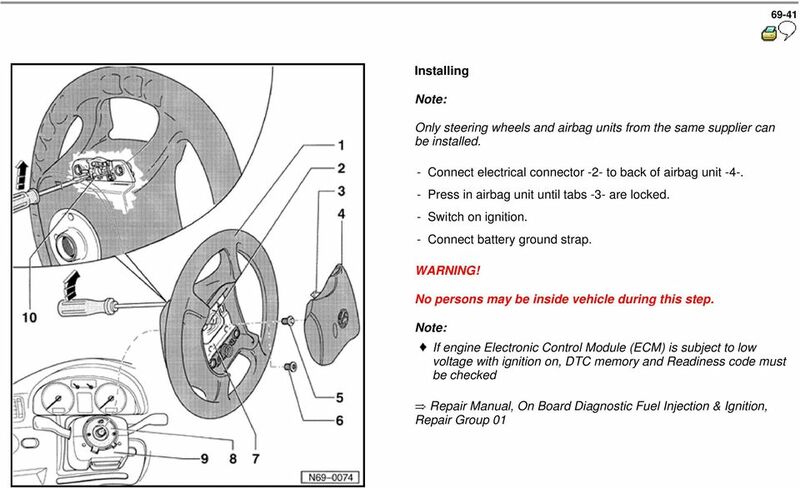 After reconnecting the battery cables, check vehicle equipment, such as radio, clock and window regulator as shown in the repair manual and/or the owner's manual. Technicians must electrostatically discharge themselves by touching door lock or vehicle body briefly before separating igniter and ground (GND) wires. The procedure for removing side curtain protection is the same for 2-door and 4-door vehicles. 42 Remove upper trim panels of the A-pillars Page Remove the upper trim panels of the B-pillars Page Remove the upper trim panels of the C-pillars Page Remove inside roof lining Page Disconnect the battery ground strap. - Detach connection Remove screws -4- and pull side curtain protection downward out of the angle brackets (latches -2- fit the side curtain in the brackets). 43 Pull gas alternator -5- out of the bracket Remove side curtain protection without kinking. Installing Install in reverse order of removal. - Switch on ignition. - Close all doors. - Connect battery ground (GND) strap. WARNING! No persons may be inside vehicle during this step. 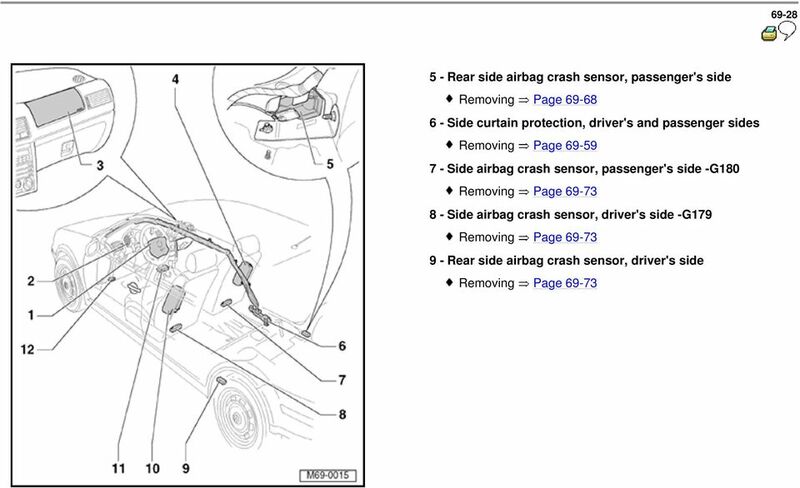 44 69-67 Crash sensor for rear side airbag, driver's and passenger sides, removing and installing In certain accident situations, the "rear crash sensor for side airbag" can initiate deployment of side curtain protection and side airbag. 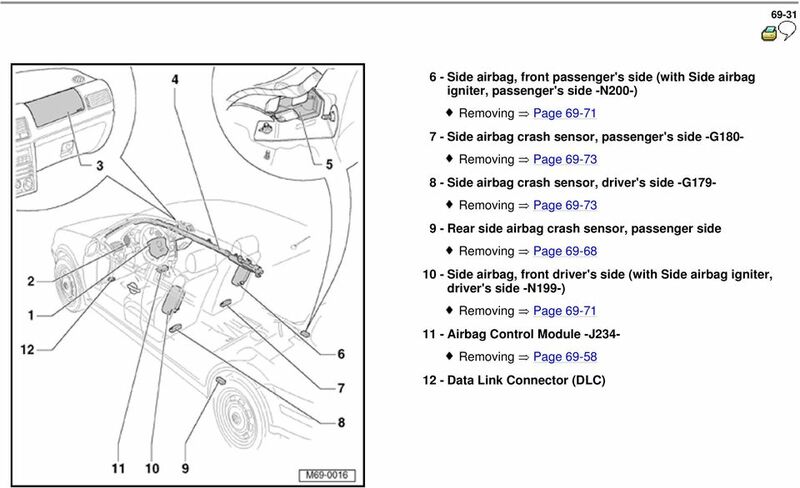 The "rear crash sensor for side airbag, driver's and passenger sides" is known as "electronic control unit side curtain protection" in case of replacement part. 45 69-68 Removing WARNING! Before working on electronic components, disconnect the battery ground (GND) strap. Notes: Before disconnecting battery cables, take all notes into account regarding coding in radio operating instructions. 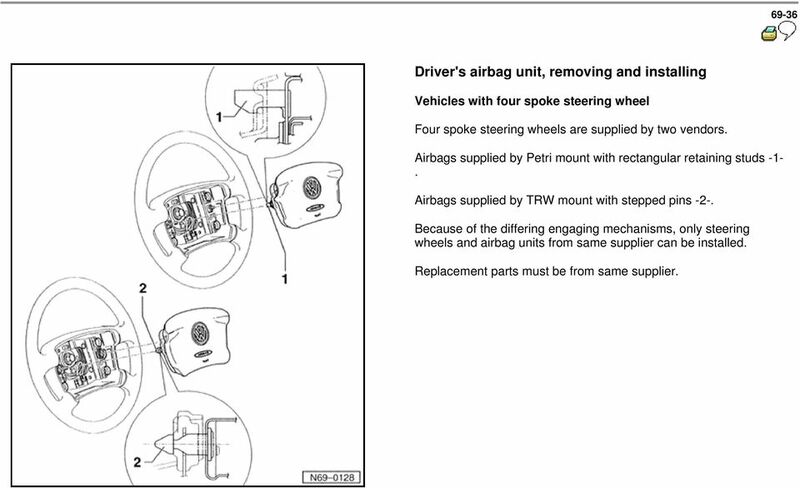 After reconnecting the battery cables, check vehicle equipment, such as radio, clock and window regulator as shown in the repair manual and/or the owner's manual. 46 Remove wheel house trim (Golf) Page Remove wheel house trim (Jetta) Page Disconnect battery ground (GND) strap. - Detach connection Remove screws -3- and -4-. 47 69-70 Installing - Attach crash sensor -1- with screws -3- and Attach connector -2- to the connector housing of crash sensor Switch on ignition. - Close all doors. - Connect battery ground (GND) strap. WARNING! No persons may be inside vehicle during this step. 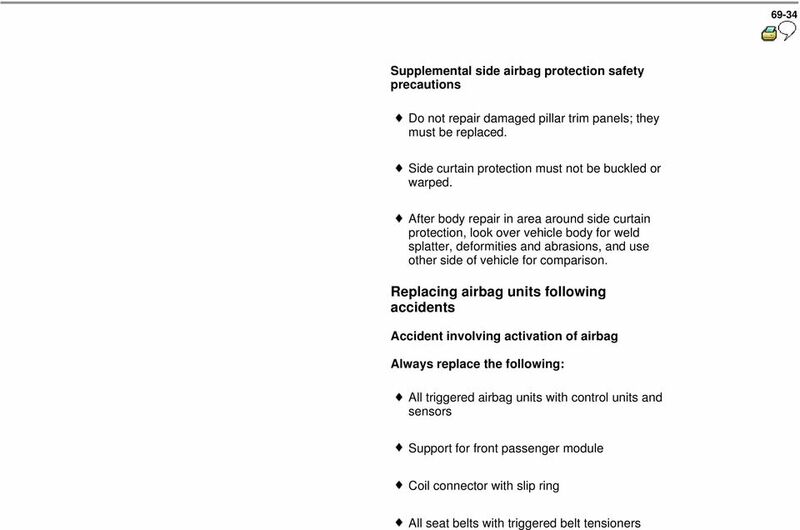 52 69-75 Airbag units, deploying (disposal) WARNING! DO NOT ignite airbag units in vehicles. According to regulations, airbag units must be rendered unusable by igniting them electrically before scrapping the vehicle. This is necessary because the airbag unit is a pyrotechnic device that may cause injuries if activated in an improper manner (e.g. using a cutting torch). 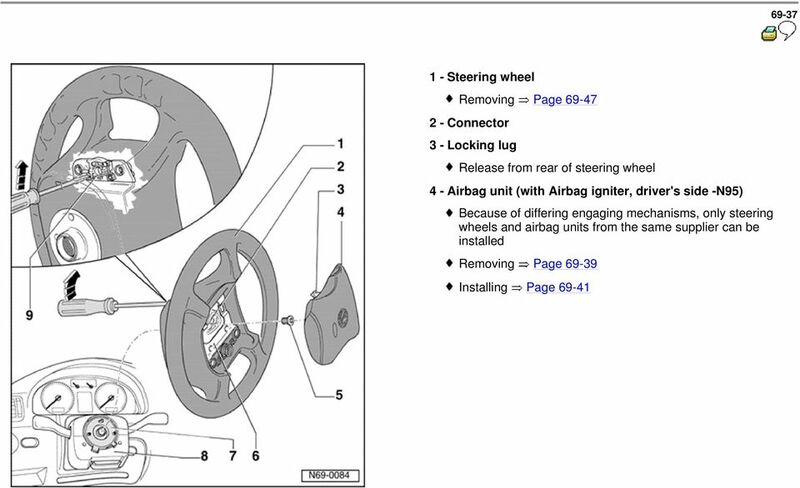 - Remove airbag unit Page Use J Deployment Fixture and refer to the Airbag & Pyrotechnic Deployment Device Instruction Booklet for proper deployment procedure. Radio system. General information. Audi A4 Sedan , Audi A4 Avant , Audi A4 Cabriolet Communication CAUTION! Installation instructions, accessories. Cruise control. Volvo Car Corporation Gothenburg, Sweden. Instruction No Version Part. No. 30739998 1. AUTO TRANS DIAGNOSIS Article Text 1998 Volkswagen Passat This file passed thru Volkswagen Technical Site - http://volkswagen.msk. BMW K 1600 GT / GTL SARGENT WORLD SPORT PERFORMANCE SEAT INSTALLATION GUIDE To protect your heated seats from wiring, lock or key damage, please read all instructions carefully before beginning this installation.